This panoramic image was acquired by NASA´s Mars Exploration Rover Opportunity on the plains of Meridiani during the period from the rover´s 456th to 464th sols on Mars (May 6 to May 14, 2005). 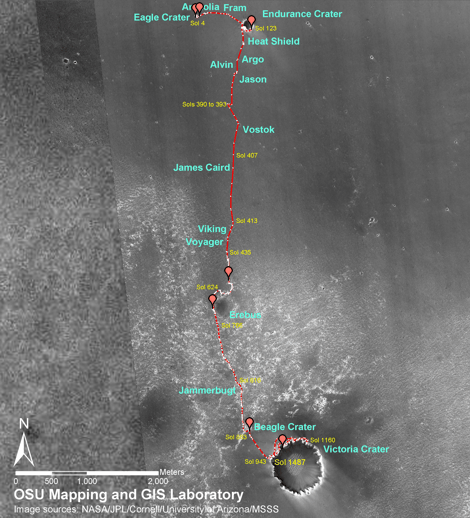 Opportunity was about 2 kilometers (1.2 miles) south of Endurance Crater. "Rub al Khali" (Arabic translation: "the empty quarter") was chosen as the name for this panorama because it is the name of a similarly barren, desolate part of the Saudi Arabian desert on Earth. The view spans 360 degrees. It consists of images obtained in 97 individual pointings of the panoramic camera. The camera took images with five camera filters at each pointing. This mosaic is an approximately true-color rendering generated using the images acquired through filters admitting light wavelengths of 750, 530, and 480 nanometers. Opportunity´s tracks leading back to the north (center of the panorama) are a reminder of the rover´s long trek from Endurance Crater. The deep ruts dug by Opportunity´s wheels as it became stuck in the sand appear in the foreground - the rover was stuck in the dune´s deep fine sand for more than a month.